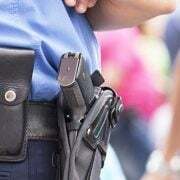 UPDATE at 3:45 PM | A FEMALE police officer shot in the neck on a domestic violence call out in northern New South Wales has been placed in an induced coma after undergoing surgery. Leading Senior Constable Helen McMurtie was shot alongside Sergeant Mark Johnston after being called to reports of a domestic assault at a home on Church Street in Glen Innes on Friday night. The local officers were airlifted to the Gold Coast University Hospital where Senior Constable McMurtie remains in an induced coma after undergoing surgery. Her condition is listed as “serious but stable”. Police have confirmed the pair were shot with a 303 centerfire rifle by 72-year-old Eric John Newman, who later turned the gun on himself and died at the scene. It’s understood the bullet which struck Senior Constable McMurtie in the throat also grazed the side of Sergeant Johnston’s face. He is understood to be in a stable condition and doing well, police said. Assistant Commissioner Geoff McKechnie said the officers were extremely lucky to be alive. “We’re very mindful we could have lost two officers here,” Assistant Commissioner McKechnie said. “Our female officer has undergone some surgery and is currently receiving further medical treatment in relation to that very serious injury to her throat. “We hope and pray she makes a full recovery. There is certainly a road ahead for her in that regard. Mr McKechnie said there had been a brief conversation between the man and police before he opened fire on them from the balcony of his home. “The way the officers conducted themselves as a team – as a unit – to extricate themselves from that very dangerous situation is, as a commander, quite gratifying to see them look after each other that way,” he said. A third officer, a female probationary constable, was uninjured. Newman, 72, was a registered gun owner and a keen trophy hunter who moved to the area almost a decade ago after retiring, the Daily Telegraph reported. A neighbour told the publication Newman died “a lot of game shooting in Africa” and had “a lot of taxidermy in his house”, including giraffes and bears. His wife, 59-year-old Lesley Ann Newman, was found nearby with minor injuries shortly after the shooting after fleeing her gun-wielding husband. 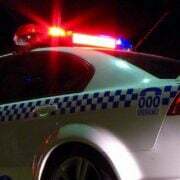 The New England Highway (locally Church Street) was closed for more than 17 hours while specialist police examined the scene. The roadblock was lifted just before 4pm on Saturday. A Critical Incident Investigation Team from Western Region has been tasked to investigate the circumstances surrounding the incident. The investigation will be overseen by the Professional Standards Command. 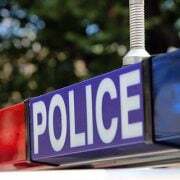 FIRST at 1:30 AM | TWO police officers have been airlifted to hospital after being shot while responding to a domestic violence related incident at a house in the northern New South Wales town of Glen Innes. In a statement, NSW Police said officers were called to a home on Church Street about 9.50pm AEDT on Friday. An hour later, while at the scene, two officers – a male sergeant and a female senior constable – were shot. The male sergeant was shot in the face while the senior constable was shot in the neck. Both were rushed by ambulance to the local hospital for treatment before being airlifted to the Gold Coast University Hospital. Police said the male officer was flown in a stable condition, while the female officer was “serious but stable”. The rescue helicopter transporting the officers arrived at the Gold Coast hospital just before 2.30am AEDT. A third officer, a female probationary constable, was uninjured in the shooting. Additional police, including specialist officers swooped on the scene and later located the body of a 74-year-old man inside the Church Street home. A 59-year-old woman was found nearby with minor injuries. It’s believed the 74-year-old man opened fire on police before taking his own life. Police have confirmed they are not looking for anyone else in relation to the incident. Church Street, also the New England Highway, has been closed in both directions and is expected to remain closed for several hours while investigations take place. Traffic is being diverted around the scene via the Gwydr Highway, and Heron and Hunter streets. A crime scene has been established and a critical incident team has been tasked to investigate all circumstances surrounding the incident.